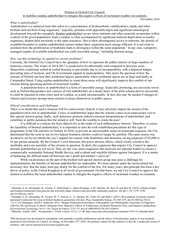 This PDF 1.5 document has been generated by Microsoft® Word 2010, and has been sent on pdf-archive.com on 12/09/2017 at 16:11, from IP address 132.185.x.x. The current document download page has been viewed 483 times. discount. Housing associations offered to voluntarily sign up to the deal with Government to make this a reality. been given on when the scheme will be extended, or what the criteria and discounts will be. 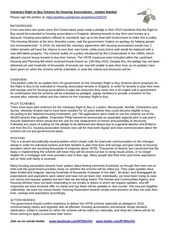 second pilot, national rollout and the criteria for the Voluntary Right to Buy. Surrey, whereby tenants had to have been resident for 10 years before they could become eligible to buy. Autumn Statement which would test the one-for-one replacement of homes and portability of discounts. scheme roll-out and governments plans. are on hold until clarity is received. lives, savings and aspirations accordingly. those wishing to apply to purchase their home. This file has been shared by a user of PDF Archive. Document ID: 00672663.